Musician Carson McHone opened for Ben Ballinger and each artist played their sets alone on acoustic guitars, and they joined together for one duet toward the end of the night. While the audience members had been talking together and greeting one another loudly since the doors opened, everyone quieted when McHone came onto the stage. She had been on the road for the last month, but in her warm greeting to the crowd, she said that it was “quite a treat to be back home playing the Cactus with Ben.” Her voice was easygoing throughout her performance, both in singing her songs and in the commentary she offered in between. That softness matched her gentle acoustic sound, which she often swayed to with her eyes closed. The songs themselves came from both McHone’s 2015 Goodluck Man, and from her current work-in-progress, which she hinted would be released in October. McHone also elaborated on the stories of her new songs’ inspirations: “Hawks Don’t Share” drew from F. Scott Fitzgerald’s marriage to Zelda Fitzgerald, and she pointed to Langston Hughes’s “Suicide’s Note” as inspiration for “Wake You Well.” When she left the stage, the audience cheered heartily; it seemed that as many attended for her performance as for Ballinger’s. But only one song offered both McHone’s gentleness and Ballinger’s meditation: their duet, “Flower Girl.” The lyrics told of an odd couple who promise to love one another and who envision a lovely life together. While the song appeared whimsical, the musicians both leaned into the microphone to sing the earnest chorus: “If you’ll be my flower girl, I will be your breakfast boy, with your purse full of petunias and my wallet full of waffles.” McHone stepped away when Ballinger sang through the verses, but they were face-to-face to for “flower girl” and “breakfast boy.” Together, the two musicians gave the crowd a silly-sounding love song which possessed great sincerity, and was sung and strummed at a calming pace. The Posies performed their alternative music hits Sunday night in the Cactus Café, at the University of Texas at Austin. Over nearly two hours, Ken Stringfellow and Jon Auer played nineteen songs to celebrate the 30th anniversary of the band they founded. Before the two men took the stage, Colorado musician David Taylor Fox opened the show with eight songs, joined by local fiddle-player Andrew Noble for four of them. This opening act was pure, soulful folk, as Fox sang, strummed his acoustic guitar, and stomped along with Noble. His songs began gently, but quickly climbed to impassioned crooning which Auer later called “scorched-earth falsetto.” Fox consistently powered through his highest notes with fearless emotion, and showcased his bluesy craft spectacularly. 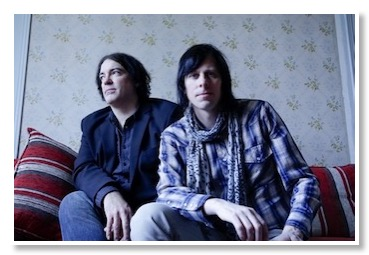 Then, the two Posies members took the stage to hearty applause from the packed café audience. Stringfellow and Auer led the audience easily through their set, keeping moments between songs light with joking banter and casual guitar tuning. They improvised impersonations, plucked famous guitar riffs (the Peter Gunn Theme, for one), and took a pair of large tequila shots to raucous audience approval. However, there were also a few surprise deviations from their usual guitar-playing: Stringfellow switched to playing keyboard for a few songs, and singer Kari Blaine lent her husky vocals to a pair of tunes later in the night. Much of the concert’s music, however, was exactly what the diehards’ audience had come to see. The Posies performed their signature power pop effortlessly, their voices harmonizing apart quietly, then built together to a crescendo. They managed to create a wavering aura across all of their songs, both popular (“Soul Sister,” “Flavor of the Month,” “Dream All Day”) and lesser-known. This was masterful alternative music, teasingly approaching rock, but always sinking down into the more accessible vibes of indie wonderings. Such contemplative music nicely reflected the mood of the two men, as the Posies seemed to both wonder at their own extended history and appreciate it. They sang of how they “used to be young with a strong constitution,” and gave a toast, saying, “Thanks for thirty years.” Before these came the joke that excessive tequila drinking was “one of the warning signs” of growing old, and a winking request for dimmer, “age-appropriate lighting.” Despite these, Stringfellow and Auer didn’t spare an ounce of energy, which earned increasing audience response as the night went on. While playing, they showcased a singular intensity, though they remained jovial in between the numbers. Those serious instances didn’t pervade all through the night, but, on the final stop of their 30th anniversary tour, both men were likely thinking of the time gone by. 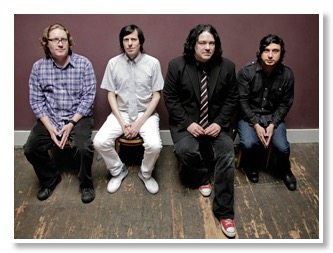 Perhaps the audience noticed: Having played their last scheduled song, the Posies walked off the stage, only to be cheered back into a few more encore songs by the crowd’s standing ovation. The occasion had elevated these two musicians near legendary status. But then, the two men stepped down off the stage to the café floor, turned on a few more of the lights, and performed the last song at the feet of their fans in the front row. Smiling, but also sweaty and concentrating, Stringfellow and Auer closed the gap between artist and fan. This way, the final music was sung with simple grace at the listeners’ level, just where the two performers had ultimately spent the entire night anyway.